I love The Chicago Transit Authority (CTA) a whole bunch (I’ve decided to ignore the new Ventra Card system debacle). Chicago is one of the few cities in the United States with a reliable, expedient system of public transportation, a fact for which I am immeasurably grateful. At its best, public transportation provides convenient, reliable service for city dwellers, and that is essentially my experience. Complaining about the occasional outage would only serve to prove how reliable CTA service is. Each year, I might expect to endure about ten truly difficult experiences. These encounters are usually on holidays. 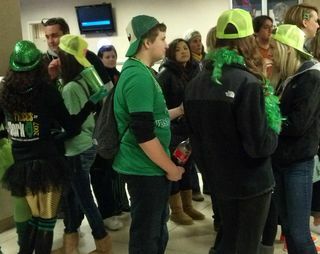 For instance, St. Patrick’s Day rapidly devolves into a glittery, green nightmare. Particularly busy weekends present unique challenges; the Crosstown Classic means encountering both drunken Cubs and Sox fans on The Red Line. Under special circumstances, the trains can get exceedingly crowded. The blizzard of 2011 was pretty interesting, but much worse on car owners. Thus, 350 days a year, I get where I need to go without hassle. The efficiency and scope of the CTA is marvelous. I’m always discovering new ways to get to point B. My commute to work is an easy thirty minutes on one train. My neighborhood is on the Blue Line which runs into the city in one direction and straight into O’Hare with service 24 hours! Additionally, my neighborhood provides access to six handy bus lines: Fullerton, Diversey and Armitage for East-West travel; Kimball, California for North-South travel, and the good ol’ Milwaukee bus cuts at a diagonal from my neighborhood along the train lines, for more on-off access. The addition of bus tracker, trip planner, and other transit apps makes getting around easier than ever. I don’t have to do anything when on the train or bus, so don’t. Typically, I don’t read on the train, still it pleases me to see so many Chicagoans reading. I don’t listen to music. I just sit. I think about my day. On the way to work, I plan my classes in my head. More often, I observe the people around me. I hunt for clues to unlock the secrets of who they are. They reveal themselves to me through gestures and actions. Most get up and offer a pregnant woman a seat, though some do not. Unseasoned tourists perpetually block doorways, infuriating regular riders. Children obey their own instincts, touching everything and asking incessant questions. Young mothers play charming games or outright ignore their children. Strangers bend down to pick up a forgotten umbrella and pass it through the doorway to its rightful owner. The public is a curious entity, and I am happy to study them, briefly, while I head where I want to go. December is a special time for CTA love, thanks to the seriously fantabulous phenomenon known as the CTA Holiday Train. Knowing such a thing exists is enough to make people happy. A ride on The Holiday Train provides enough holiday cheer to get Chicagoans through mid-January. 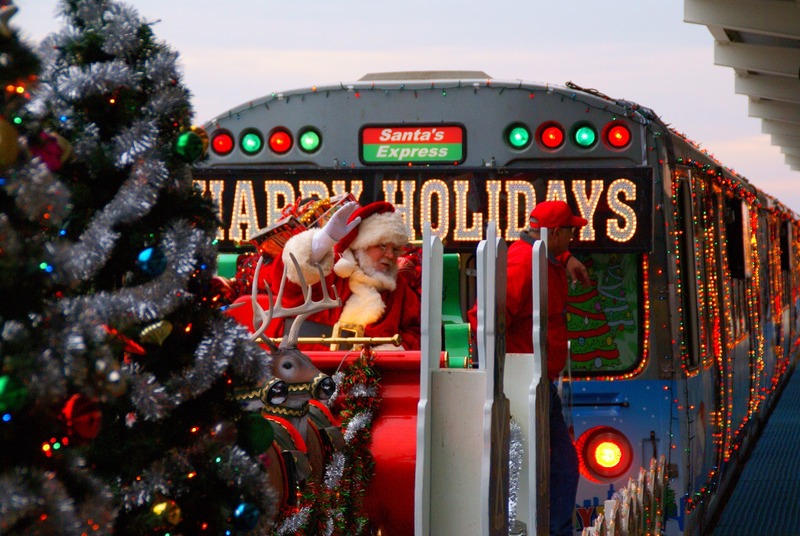 Ordinary train cars are transformed by colored lights, wrapping paper, candy canes, and elves. There are even advertisements for services offered in the North Pole. I haven’t even mentioned that Santa and his reindeer ride on an open-air train car. He shouts, “Merry Christmas” while cruising through the tunnels and gliding under and over the streets of Chicago. The CTA is insanely awesome. Here are the pictures to prove it. Even better, DC’s Metro. Amazingly clean, frequent, and well-marked.